This is a book everyone in the family will love. 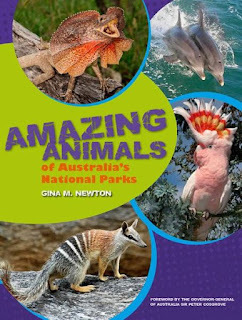 It’s jam-packed with information about Australian animals and their national park habitats, and it’s superbly designed to be user friendly. Information: There are fun and interesting facts about more than 120 Australian animals. Learn what they are, where they live and what their lives are like. Newton has picked a wonderful selection of animals, from Australia’s most iconic to the wonderfully hilarious and mysteriously obscure. There are so many animals in this book I didn’t even know existed, and Newton’s ability to translate scientific facts and figures into easy-to-read and entertaining information is a true gift. The kids will not get bored reading this book. Layout: The book is divided into habitats: forests, rainforests, arid zones, wetlands and more. There is an introduction for each of the habitat types, with examples of the national parks that fit the category before the book launches into the animals that call these places home. I really loved how the book was divided up this way. You learn which animals live in the same habitats, and for animals that thrive in more than one, there are habitat icons at the top of each page to indicate all the habitats an animal can be found in. Design: The book has been designed to make it easy to read. Each page is formatted the same, so you’ll find the same information in the same place for each animal. There are also fast facts (weight, length, lifespan and more), a location map, an endangered species status traffic light and habitat icons, so information can be found easily and quickly. Photography: There are beautiful, high-quality photos of every animal and national park featured in the book. The photography is amazing and awe-inspiring, with wonderful close-ups of delightful creatures and magnificent places. Extras: You get so many extras with this book. There’s the glossary at the back, which features definitions and details about the more complicated words and terminology, a large map showing the location of all the national parks in the book (including their habitat type) and a magnificent table of featured parks and animals, which allows you to look up exactly which of the animals in the book can be found in each national park featured. Amazing Animals of Australia’s National Parks is a book worthy of a permanent home on your coffee table, always there to be explored by family and guests. It is a useful resource for school assignments and for anyone interested in learning about Australia’s diverse and amazing wildlife. And if you’re a teacher (or a parent or just interested), don’t forget to check out the teaching notes on the National Library of Australia Publishing website. There are notes for a range of different school grades with learning frameworks and fun activities. I can see why this book has been shortlisted for the 2017 Children’s Book Council of Australia Book of the Year Awards. It is amazing!